A surgeon and avid mountain biker from Houston, Texas had an unfortunate accident while biking in Moab, Utah. He inadvertently hit a rock, was thrown off his bike, suffering a serious shoulder fracture that left him unable to perform surgery for several months. Unbeknownst to the physician, his employer disability benefit had a cap of $10,000 per month. With a recent home renovation, four children to support and his oldest daughter headed to Rice University, he was forced to dip into his savings to cover his family’s expenses. How Much Disability Coverage is Enough? To continue with our example, the physician portrayed is earning $350,000 as a surgeon. Insurance professionals recommend protecting at least 60 to 65 percent of one’s annual income. That means the physician should have a total disability benefit of at least $210,000 a year, equaling $17,500 a month in benefits. Currently the disability benefit, provided by his hospital is capped at $10,000 a month, leaving a gap in coverage of $7,500 a month. An individual disability policy can help fill the gap in your employer coverage. A TMA Insurance Trust advisor can help you calculate and cover the gap in your current disability policy. As licensed, non-commissioned agents, our advisors pride themselves on offering unbiased guidance with no sales pressure. • Your salary has increased but your disability benefit has not been adjusted accordingly. • Due to budget cutbacks and reorganization, your employer has decided to reduce or eliminate your benefits. • If you leave your current employment you will need to obtain your own individual policy, since most employer policies are not portable. • If your employer pays for your coverage, your benefits will be taxed as income leaving your family with less income than you planned for at a most critical time. TMA Insurance Trust offers a range of plans from the leading carriers in Texas. One plan you may want to take advantage of is Guardian Provider Choice, offering true own-occupation disability coverage to TMA members with a 10 percent discount and guaranteed benefits for the life of the policy. This type of coverage provides full disability benefits if you are unable to perform the medical specialty practiced before becoming sick or injured. You can work in another specialty, within or outside of your field, sometimes even in your own practice, and not forfeit your disability benefits. If you are a resident, you’re likely to have some disability coverage from your employer while in residency. Yet most long-term disability policies offered by employers don’t provide enough income to pay your expenses, loans and debts, if you aren't able to work. Once you graduate, you’ll need an individual policy that can travel with you during your career. So why wait? The best time to buy an individual disability policy is when you are young and healthy, most insurable, and can lock in a more affordable rate. 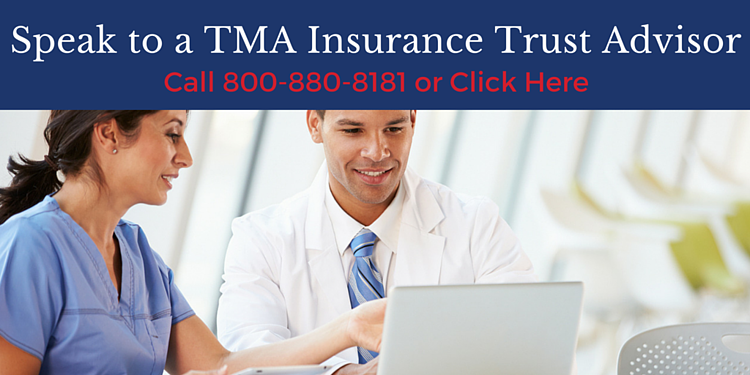 TMA Insurance Trust offers starter plans and plans from the leading carriers in Texas. • Student Loan Benefit Rider helps you make student loan payments while you are not able to work. • Cost of Living Adjustment Rider (COLA) indexes your benefit to inflation. • Future Increase Option allows you to increase your monthly benefit when your salary increases without any additional medical underwriting. • Enhanced Partial Disability Rider lets you collect benefits even when you are partially disabled and not earning your full income. TMA Insurance Trust advisors are dedicated to helping Texas physicians secure the best coverage at each stage of life and career. Because we know you are busy, we’ll make it easy to find the right coverage, providing research, comparing costs and making sure you receive the TMA discounts available to you.